I tend to wonder if conditions like fibromyalgia are related to immune dysfunction and inflammation. After all, often the first symptom when you catch a virus is a horrible aching and fatigue. The virus is not typically the agent causing the symptoms—often it is your immune response to it. I also tend to think that we modern humans, given our chronic stress and suboptimal diets, might be somewhat micronutrient deficient, particularly among the minerals. Magnesium is one mineral that we likely don’t get enough of, partly because major historical sources were organ meats and mineral water, and partly because our agricultural soils may be somewhat depleted of minerals. Since sufficient magnesium is necessary to regulate our stress response, it would make sense that a chronic, low-level insufficiency of magnesium could lead to all sorts of chronic problems. The diagnosis of fibromyalgia has become more popular recently because there are several expensive new drugs FDA-approved to treat it… But what if there were an even cheaper, easier, less side-effect laden pill or supplement to take for fibromyalgia? How about magnesium? As I mentioned earlier, magnesium deficiency can cause us to be more vulnerable to a poorly regulated stress response, and magnesium is absolutely necessary to metabolize energy efficiently. Since most magnesium is stored within cells and bones, a simple serum level generally won’t tell us much. Since we die rather quickly of heart problems if our blood levels are low, our regulatory systems pull out all the stops to make sure our blood levels remain within a certain range, even if our bodies are relatively deficient. Why magnesium? The researchers were intrigued by the idea of fibromyalgia being a disease of oxidative stress, and mineral deficiencies are known to predispose folks to oxidative stress. Magnesium plays a critical role in the various processed turning the food we eat and our fuel stores into energy used by the cells. It was postulated that muscle cells could be low in magnesium while the blood levels were maintained with normal limits (to preserve the heart), and this low magnesium could cause problems with muscle cells turning fuel into energy, thus fatigue, weakness, and pain. 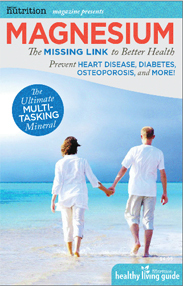 A previous study showed that 300-600 mg of magnesium malate daily improved the symptoms of fibromyalgia (1)http://drbobseiler.com/wp-content/uploads/2010/09/article_08-37_abraham.pdf. Another trial used a mix of magnesium supplements (low and high) with similar results to the previous study in the high-dose arm (2)http://www.ncbi.nlm.nih.gov/pubmed/8587088. …magnesium levels [both serum and red blood cell] were lower [in fibromyalgia patients] than in the control groups and there was a correlation between magnesium and Visual Analog Pain Scale (VAS), the number of tender points, tender point index, the fibromyalgia impact questionnaire (FIQ), the Beck depression and anxiety score and clinical symptoms such as fatigue, sleep disorder, headache, numbness and gastric disorders. All of these findings support the fact that magnesium plays an important role in the development of fibromyalgia. The magnesium seems to help, that it does could be significant for many. It certainly seems worth a try, considering the risks and costs of the FDA approved treatments and the multitude of benefits from getting one’s magnesium levels up to snuff. These are not massive doses. Considering the average diet gives us maybe 250mg daily, adding 300mg daily puts us just a little above the RDA. If you have healthy kidneys, this amount of magnesium supplementation is generally quite safe.